experiences from the business and the effects of this machine. Below is a flyer for complete details. MOVE IN NOW AT AMAIA SKIES CUBAO! Amaia Skies Cubao is now approaching the final stages of construction. The project is ideal for professionals who would like to be in an area accessible to almost all means of commute. It is near the Gateway Mall, Araneta Center and it is considered the Central Station of the MRT and the LRT 2. Here is the route for the MRT ( Metro Rail Transit ) which goes from North Quezon City to Taft Ave. Station. Intersecting the East to the West section of Manila is the LRT 2. It covers the area of Santolan Station in Pasig to Recto Station which is known as the ” University area ” in the Philippines. Soon, the LRT 2 will expand further as it finishes it’s Antipolo Masinag station. With it’s prime location for yuppies, we see this property as an attractive investment for rental use. A target market of professionals working in Ortigas and Quezon City are expected to lease the unit. 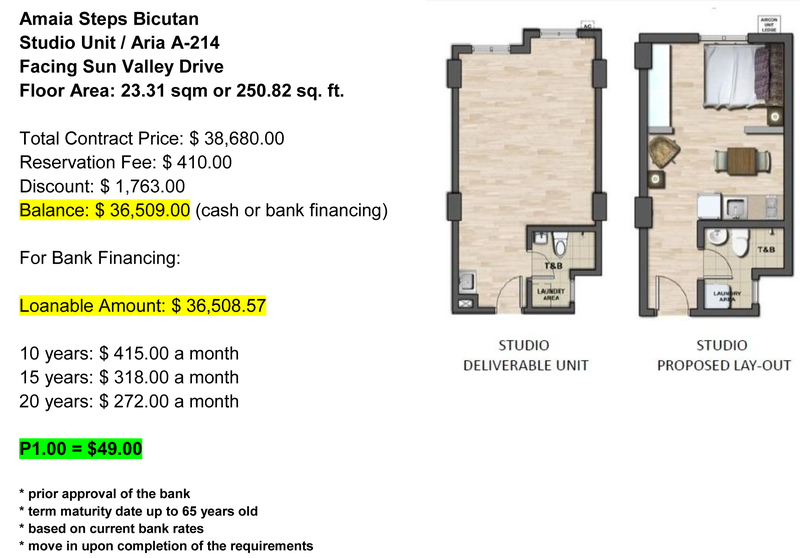 With the rent to own terms offered exclusive to our group today, the prospective buyer would just need to reserve a unit for $ 410 dollars, before paying $ 275 a month for a finished studio unit. The good thing for investors is, they can use the property once they’re approved by our partner bank. They can also have it enrolled through our rental program to help reduce their mortgage. Here are two sample quotations for a studio and a 1 bedroom unit. If you have any question regarding this property, let us know and we will be more than happy to assist or join us on January 21 so that we can discuss further. Reserve your Amaia property today! Want to have an idea how much you will invest for an Amaia property? Get a sneak peek today and reserve a unit with us now! Another year has passed and we are in a time where we evaluate ourselves. Our performance has allowed us to add more members to our company, a bigger space for office, and a promotion of a coordinator to a manager. These are all small signs of improvement in our operations and we are looking forward to serve our clients with the expansion of our services through “short term“ property rentals. It has become a selling point especially for our investors. Some agents would also say the same, that they can have your unit rented out, but in fact, do nothing about it when the time comes your property is ready for occupancy. For us, we have compiled some testimonials from the clients who we continuously develop our relationship, and you will see it on our posts in the next few days. 2017 is another time for excellence. We are optimistic of the market that we serve, as we try to improve by the means of an increase in production and closed deals. With this, here are some of our New Year’s resolutions for our clients, partners, lessees, and developers. We have never ignored our clients especially when it comes to their concerns. We’ve fought for their rights and we always explore every possible avenue to come up with a solution. The usual concerns of our clients is the demand letters that they got from developers and the penalties that was incurred which is sometimes not justified. We look forward on solving your problems, but please, we also need your cooperation. Your response is very important in authorizing us to handle a particular concern. A delay in this action would affect a particular request. Without our referrers and marketing partners, we will never be able to be given a chance to present our unique programs. We will try to communicate and engage with you in our future presentations. Thank you for the trust that you’ve given. We are confident that we have been able to serve your needs very well. Our door is always open if you have any comments or concerns. We have forwarded some valid requests from the clients. Unfortunately, we have become irate at times with the slow processing of these requests. But then, in the end, we realize that who we’re talking to, is just doing his job. Usually, one doesn’t have the full authority to decide on a particular request. So the problem might be in the system. A system, that doesn’t allow long term relationships to flourish between the developer and the buyers. A system that is prone to miscommunication with different departments. A system that is prone to a higher turnover in their jobs that the new replacement will be a pawn to the current concerns of the previous buyers all resulting in bad customer service. And with this, I thank the developers for their lack of empathy to their buyers. Without you, (pardon the pun) we have increased our contacts and we are still in business. But again, more than anything, we would like to engage with our partner developers as much as possible to provide a faster resolution of the clients’ concerns. Ever wondered how to get a home loan but you don’t know which bank to approach? 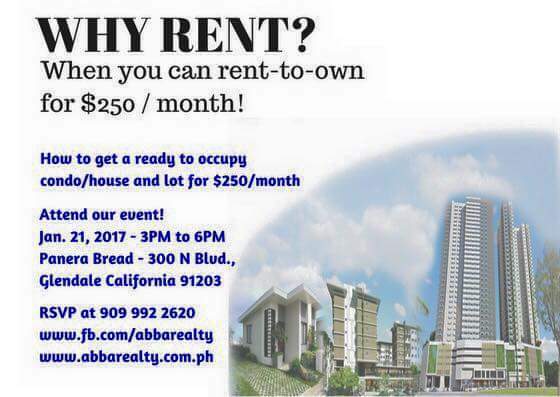 Or perhaps you are outside the Philippines and you want to invest in real property but does not have a physical representative in the country? Abba Realty has partnered with Bank of Commerce (BoC) to help make your dream property a reality. 1. BoC terms is very attractive. They have a 5% downpayment (DP) scheme then the rest can be enrolled in bank financing. Compared to other banks, BoC can accommodate financing of up to 95% of the total contract price while other banks only offer 80% to 90% financing scheme. 2. BoC has longer terms. Subject to approval, BoC can accommodate loan maturity date of the applicants until they are 70 years of age while other banks restrict loan applicant’s maturity date up to when they are 60 years old. 3. Ease of processing. Applicants can send through email all their requirements including their signed application form to Abba Realty. This is very useful especially if you are an investor residing outside the Philippines. 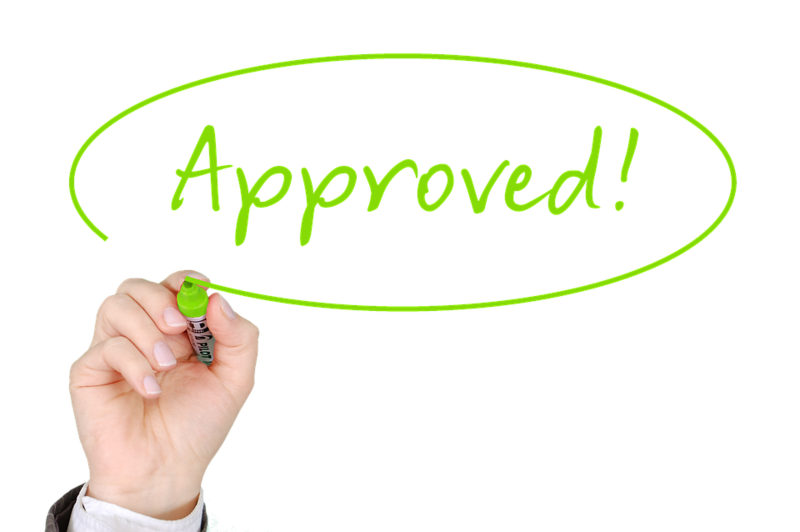 Once the loan is approved, applicant can just send us Special Power of Attorney so that we can have the documents notarized and have the original copies sent to our office. 4. Fast approval turnaround time. It takes 2-3 weeks for your loan to be approved as long as requirements are complete. 5. You will be well represented. After the approval, Abba need a Special Power of Attorney to enact all the requirements for your home loan. Your attorney in fact will open an account where you can deposit the payment for your monthly amortization. We hope that we have piqued your interest to start on your new investment this year! Call us today to inquire. Loans, like auto and home loans, are becoming more accessible. Different banks have become more and more competitive with their rates to the benefit of the customers. If you are interested to apply for a home loan but do not know where to start, check out this short video we prepared for you. Now, more than ever, acquiring a real estate property has never been easier. If you already have that property you dream of, let us know and we will see how we can be of help. If you just want to invest but do not know which property would generate you better returns, drop us a message and one of our sales representatives would be more than happy to assist you. Here in Abba Realty, we always have your best interests at hand. Are you looking for an affordable area that is near Bonifacio Global City and the Makati Central Business District? Are you inclined to getting a bigger space just outside these business hubs? Do you prefer having access to resort-type amenities after a long day at work? Then, these properties that we have in Cypress Towers may be the perfect choice for you. 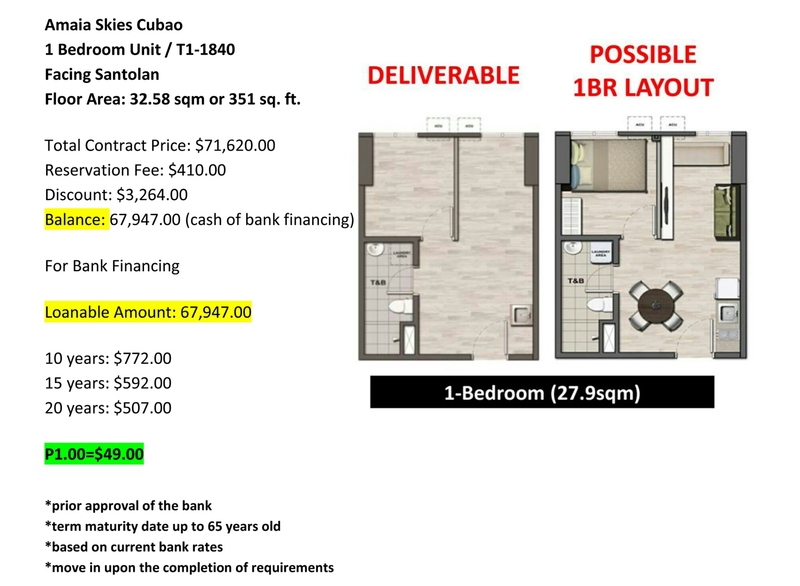 A 2-bedroom unit in Cypress Towers is currently offered at P 15,000/ month ($ 307/month ) for a one-year lease. This is the same as the rate of a studio unit inside Makati. It features 50 sqm consisting of 2 separate rooms, a common kitchen, dining area and a toilet and bath, making it the ideal unit for employees and professionals working in the area of Makati and BGC. What’s even more attractive is that this property is highly accessible and ideal for busy professionals who would like to enjoy the amenities such as a swimming pool, gym and jogging paths after a long busy day. Cypress also features its signature open corridors ideal for people who are uncomfortable of closed and tight spaces usually characteristic of other condominium properties. Check out our available units in this project. We have a few studio units, 1- and 2-bedroom units available in this project. If you have any questions regarding the travel to and from the office, please post it in the comments below. We may be able to help you out. Most of the tenants enjoy the accessibility of this building to their daily commute because there are a lot of options going to Makati and BGC area from Cypress Tower. This two-bedroom fully-furnished unit is housed on a 50 sqm property with a spacious living .room, 1 toilet & bath and a balcony with a view of Antipolo Hills. If you are interested and would like to inquire about these properties, drop us a message here and we will get in touch with you shortly. Why one should consider staying in Shell Residences? Over the past few months, we have talked to some of our tenants who are willing to give their insights on their new unit rentals or house hunting experiences through my team. To engage our clients, we decided to make a routine invitation in our office after they moved in. These videos are documented for us to improve our services even more. Let us hear what Marivic, our new tenant, has to say. Arra: Hi, good evening. This is Mae from Abba Realty. I’m here to conduct a short interview with one of our tenants, who just moved in Shell Residences. Please introduce yourself. Marivic: Hi Im Marivic, and I’m 26 years old and I’m working here in Makati. A: Why did you choose Shell Residences? M: The location is convenient as it is near the mall and commercial centers, the airport, and also, this location is accessible to my workplace. A: Why did you choose the one-bedroom unit? M: Because we both like the bigger space that it offers. It is just enough for the two of us. We feel that a two-bedroom would be too much, but the one-bedroom is just fine. A: What do you like in the building or development? M: I like their amenities and their security of the place. Also, it is peaceful here. A: What can you say about our service? M: What can I say? Hmm.. very nice service.. very good, and very friendly. A: Ok. That’s it for today. Bye! Our tenants has successfully moved in, but that doesn’t mean it is the end of our transaction. We are here to support them year round. In fact, we are still looking for more units to offer for rent in Shell Residences. With the rise in demand from our corporate accounts, we will be glad to add your unit to our inventory. Enjoy the luxury and comfort of living in these residential units in Makati. With everything at a stone’s reach, from your workplace to your party place, renting a unit in any of these spaces spells the GOOD LIFE at its finest. This one-bedroom, fully furnished unit with balcony will give a taste of luxurious living that you may be looking for. With its British-designed interiors, this unit features a great view of the Makati cityscape. This studio-type, semi-furnished property features 1 toilet and bath and sits on a 27.68 sqm space at the heart of Makati. The property comes with a convertible sofa bed and is a clean, polished space that you may enjoy. This 2-bedroom, fully-furnished unit sits on a 49 sqm space and has been fully renovated by the owners. It features a lot of storage and a bar, perfect for a young executive who is looking for a grand space at the heart of the metro. This studio-type, fully-furnished unit maximizes its space to provide a clean but useful space for its homeowners. The unit has is a Megaworld Corporation property and is a block away from the Ayala Business District. It is a stone’s throw away from famous commercial malls such as Glorietta, The Landmark, SM Makati and Greenbelt. It is also near schools like Centro Escolar University, Jose Magsaysay Elementary School, Facilities Management College, and preschool Cambridge Child Development Center Philippines. 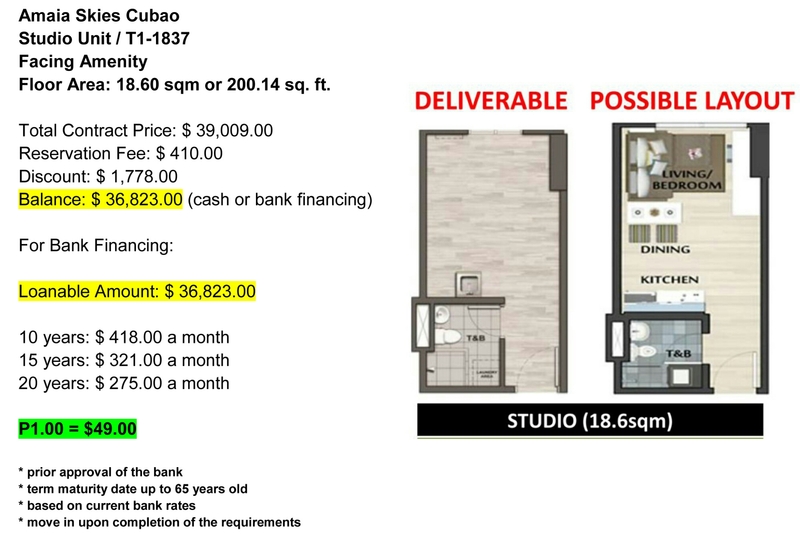 If you are looking for a place to rent near RCBC in Makati, then this unit is perfect for you. Located at the 18th floor, this studio-type, fully furnished unit has never been rented and is waiting for its first tenant. At the heart of Greenbelt complex lies a posh condominium unit that has access to amazing amenities. A secured residential unit may be something that you are looking for with an elite status that comes it with. This 1-bedroom, fully furnished unit is FOR SALE and is currently the most affordable unit available at The Residences at Greenbelt. This amazing space is expansive with around 68 to 70 sqm of space, a laundry area and comes with a parking slot. So, what are you waiting for? Have a taste of this good life with these luxury units at the bustling Makati district. Contact Abba Realty today and our sales coordinators will happy assist you to finally bring you your dream residence.